Gutters and downspouts should be cleared out twice a year. Once in the spring after the seeds fall. And once in the fall after leaves come down off of trees. With our specialized 5 step gutter cleaning process, You can rest assured, your water diversion system is clean and functioning properly. If you think a few leaves and twigs in your gutters are harmless, think again. Regular gutter cleaning is the single most important key to avoiding major and expensive home repairs . Gutters perform one duty: controlling the water around your home. If debris keeps gutters from doing their job, you can wind up with some serious problems. Leaking Gutters: Clogged gutters are the number one cause of basement water problems. When gutters are clogged, roof water overflows and accumulates around the foundation. If this happens, basement leaks may be moments away. Cracked Foundations: Clogged gutters can cause excess water against the foundation wall to weaken the footing and lead to foundation wall cracks. This is particularly true in the colder months when built-up water at the foundation freezes and causes a condition known as “frost-heave” which can cause severe cracks to foundation walls. Rotten Wood: Water backing up from clogged gutters will cause moisture damage to the wood fascia around the house. 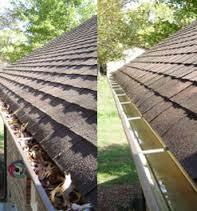 The rotted area will quickly get worse if the leak is not eliminated by cleaning the gutters. Leaking Roofs: In winter, ice dams can form on top of clogged gutters. Snow then builds up across the top of the clogged gutter and freezes. During the next thaw, water running off the roof is blocked by the frozen snow and backs up into the house. This can lead to major wall and ceiling damage. Slippery Sidewalks: Overflowing gutters can deposit water on walks and driveways where it can freeze and cause a tripping hazard. Avoid this problem by keeping gutters clean and the spouts extended away from any traffic areas. Washed Out Landscaping: Any newly installed plants, grass or trees can be killed by excess water from clogged gutters. Overflowing gutters can cause severe erosion and put an early end to young plantings. Wood Destroying Insects: Bugs love moisture. Keeping gutters free of clogs and keeping the soil dry around the foundation perimeter can force bugs to go elsewhere for a tasty snack of dampened two-by-four. We pride ourselves on our system of cleaning. Below is a step by step outline of what you can expect when we come to your home for your gutter cleaning. We remove leaves, acorns, sticks and any other debris from your roof. Often debris gets caught in the valleys of a roof or behind chimneys. For these situations we utilize extension poles or powerful air blowers to remove it. We remove any heavy debris from the gutters, by hand, and place into a bucket. We remove any remaining debris from the gutters with high powered handheld blowers and/or by flushing the gutters with a garden hose. Simply removing the debris by hand, as many companies do, does not adequately remove the smaller particles that are difficult to pick up. At all times, we are careful not to dirty the exterior of the gutter. If we do, we promptly clean it up! We clean up any debris produced from the cleaning and leave the property as if we were never there.